To visit the web-site, dedicated to the collection, please follow http://touch-geometry.karazin.ua. Geometry is undoubtedly that part of mathematics which one can really “touch” and “see”. This is true for those geometric objects – curves and surfaces – that appear in various mathematical facts and theories. Development of differential and Riemannian geometries at the end of XVIII - early XIX century brought this geometric “tangibility” to a new level. Using different materials (such as plaster, cardboard, metal, wires, etc.) mathematicians started creating real models for the objects they were studying. The “golden era” of mathematical models building began. Among the main promoters of visual demonstration for abstract facts were the prominent German mathematicians Eduard Kummer, Felix Klein, and Alexander von Brill. Under their supervision the first plaster models were made. 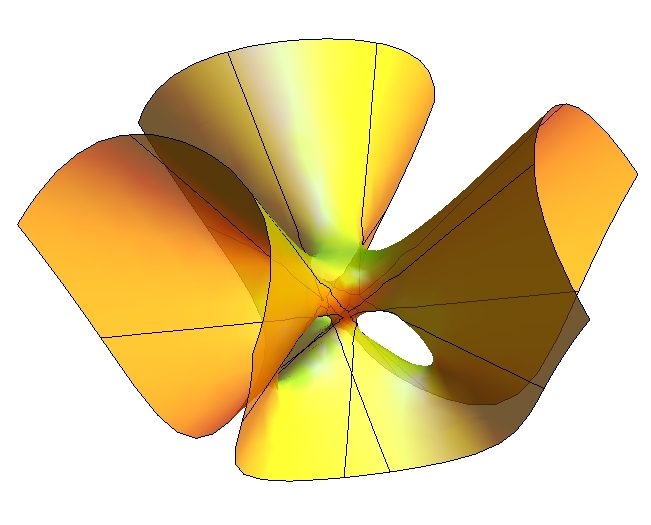 These figures have aroused a great interest in the mathematical community, and have caused a start of the models’ commercial reproduction and selling. One of the first manufactories who did it was the one established in 1880 in the city of Darmstadt by Alexander’s brother Ludwig von Brill. In 1893 Chicago (USA) hosted the World’s Columbian Exposition where the Germans presented their mathematical models. All objects were available for ordering. 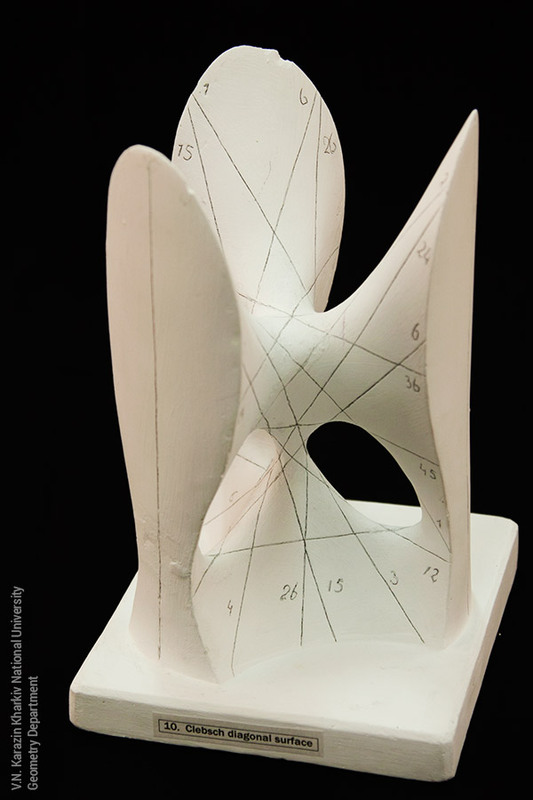 Felix Klein, being one of the exhibitors, presented the plaster model of the Clebsch surface – a third order surface that contains exactly 27 real straight lines. In his lectures during the fair Klein insisted on the importance of creating such a models for the intuition development and as a tool to fight against excessive abstraction in mathematics. The German exhibition, which had a success among the American universities, led to the appearance of mathematical model collections in the US. In 1899 Brill’s manufactory was taken over by Martin Schilling, and moved first to Halle, then to Leipzig. Already in 1911 the catalog of Schilling’s manufactory contained 40 series of models with more than 400 items. Intensive sales in Europe and America continued until the early 30s. Many universities in Europe made their mathematical model collections out of Schilling’s production as well as the production of other manufacturers. It is worth pointing that the models were actively used both for science and teaching. 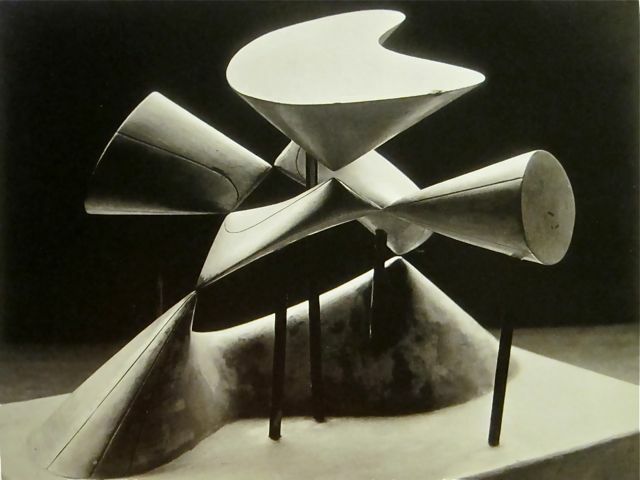 As an example, the renowned “Geometry and Imagination” by D. Hilbert and S. Kohn-Vossen published in 1932 in Berlin contains photos of Schilling’s models as illustrations. The title of this book most eloquently shows the role for which these models were created. In 1932 Martin Schilling sent a letter to the Göttingen Mathematical Institute informing that he suspends production of mathematical models. Visualization lost its significance, and a new era of math’s formalization led by Nicolas Bourbaki began. J. W. Goethe (1963). W. Kaufmann, ed. “Faust”. 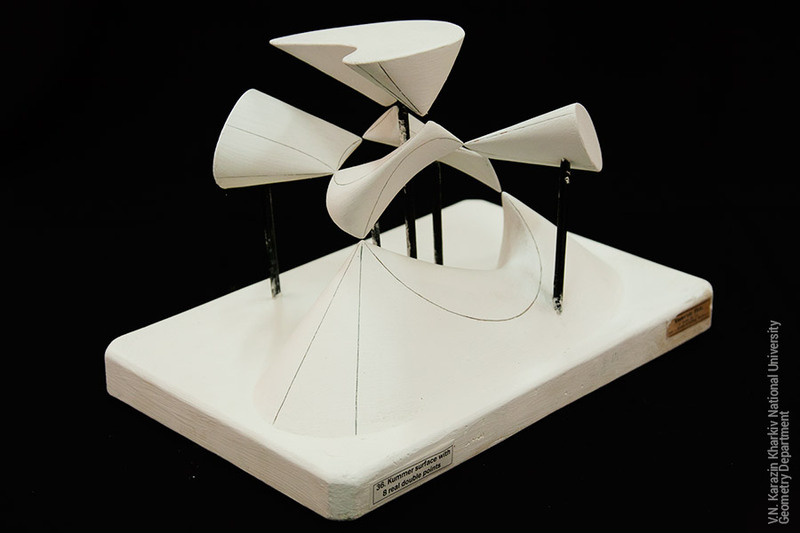 The history of the collection of mathematical (geometrical) models of V.N. 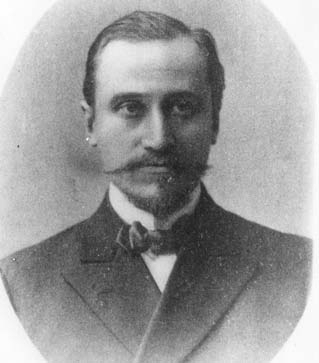 Karazin Kharkiv National University starts in 1908. At that time a professor of then Kharkiv Imperial University Dmitriy Matveyevich Sintsov opened the so-called cabinet of geometry. For this purpose, according to the preserved Book of material values of the cabinet of geometry, the first batches of models were issued from the firm of M. Schilling at Halle and Leipzig. Some part of the collection were given to the cabinet from the cabinet of practical mechanics. The core of the collection was made of the plaster and wired Schilling’s models; also some models from Weiner’s manufactory were bought. The last model in the collection was obtained in 1934 (“movable triedr on a helix, manufactured by Belyaev”). During the Second World War the collection was preserved by Sidor Ivanovich Shulyachenko and his wife Mariya Ivanovna. In 2009 all models from the collection were renovated. 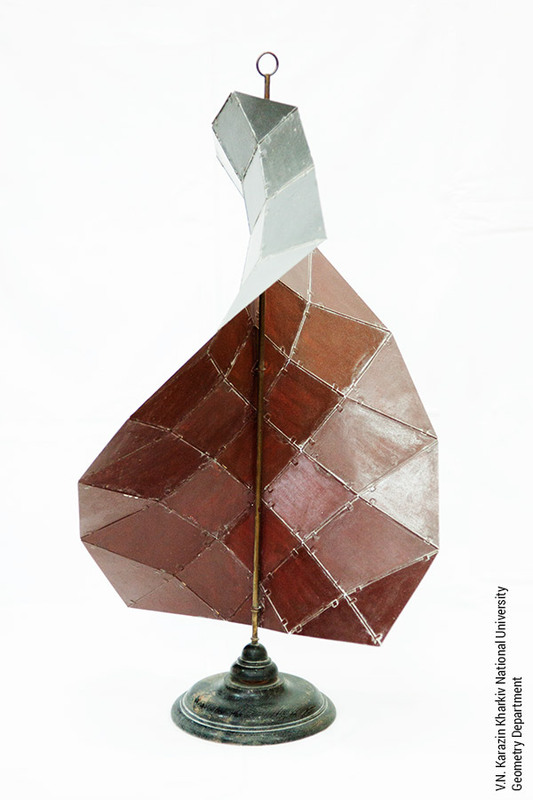 The geometrical models collection is currently stored in the teaching room of the established in 1921 Geometry Department. 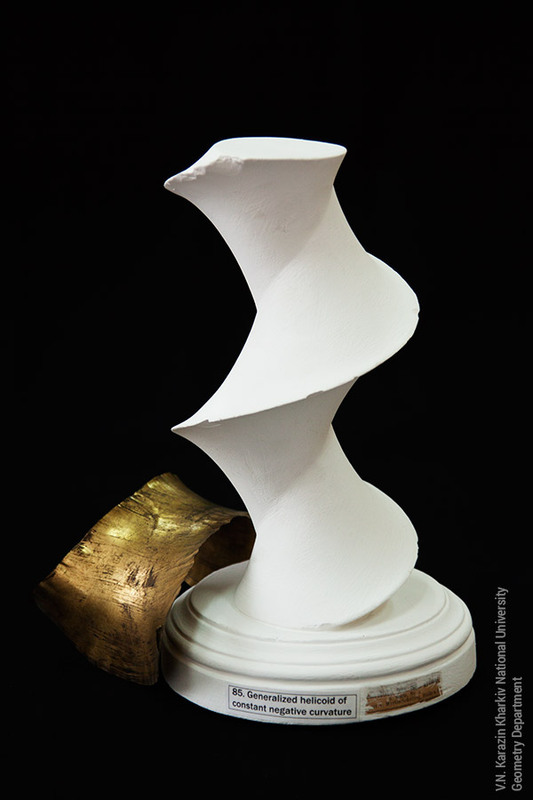 The collection consists of 240 plaster, wired, and metal models in good and excellent conditions. In 2013 it was launched the project of creating collection’s digital database with photos, descriptions, and mathematical simulations using software packages. The first draft of the collection’s catalog is now available. 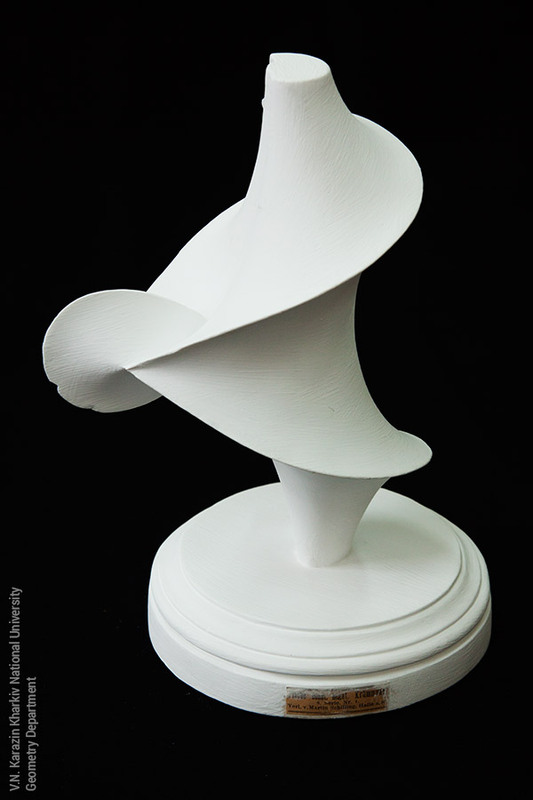 In addition to their scientific and educational meanings, geometrical models represent sophisticated samples of real art. Their elegance and semantic content continues attracting attention of artists, photographers, and architects from around the world. 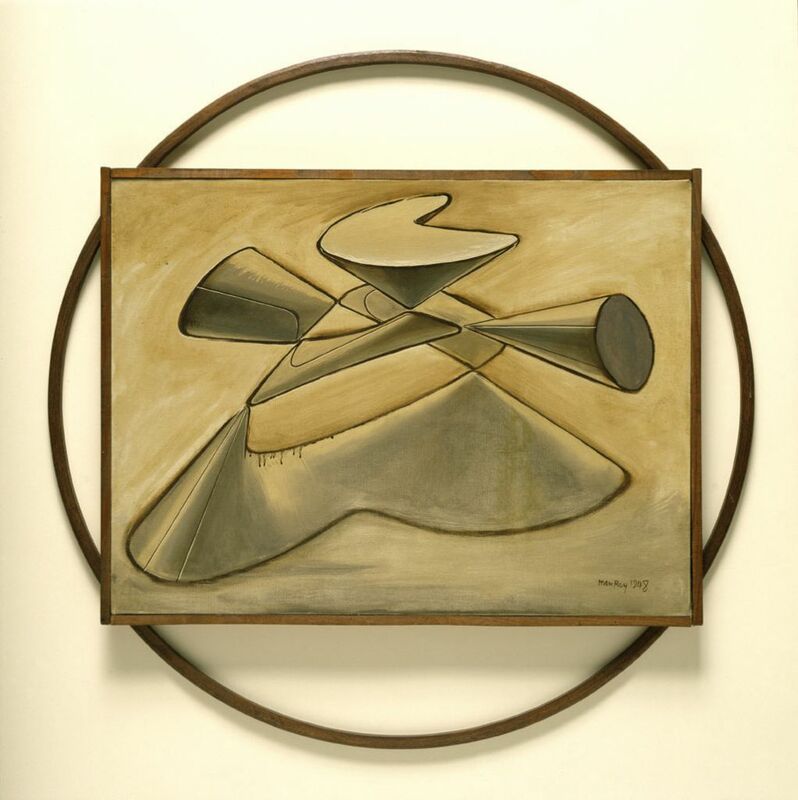 Among the most known names are Naum Gabo, Antoine Pevsner, Barbara Hepworth, Man Ray, Sugimoto Hiroshi. 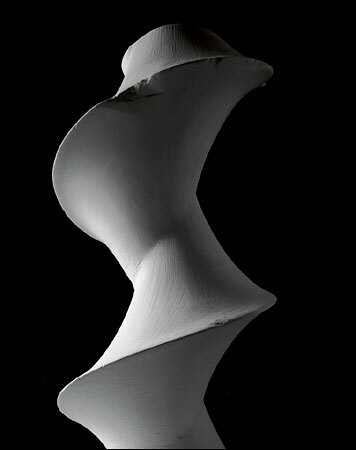 (Left) Sugimoto Hiroshi, Dini’s surface (part of the photo project for the New York Times, 2004); (right) photo of Dini’s surface from the collection of the Geometry Department – the surface of constant negative curvature obtained by “twisting” a pseudosphere.